These two churches were both in the Manchester (Grosvenor Street) Circuit, so the same form was used to provide information from both. Plymouth Grove, Chorlton-on-Medlock, seated 630. The chapel opened in 1879 and finally closed in 2008. Prior to that the original building was vacated and the plaques were disposed of, so this is the only Methodist record of these seven men. The Guild Secretary gave much more information than usual. L/Cpl. Charles C. Capstick 15th Bn. Royal Scots. Sergt. William R. Capstick 15th Bn. Royal Scots. 1. Henry Helliwell was the son of Rev. J. Uttley Helliwell, minister of the church 1913-1916. Like most Wesleyans, his religious affiliation does not appear in the record. 2. William H. Raines does not appear in any official record of the fallen. Grosvenor Street, Chorlton-on-Medlock was the main church of the Circuit, seating 1300. There appears to be no other memorial than this. Pte. Albert Allen 11th Bn. East Lancashire Regt. Pte. Fred P. Barlow 202294 4th Bn. King’s Own (Royal Lancaster) Regt. Tom Baxter 3rd Bn. Border Regt. Pte. James Dalgleish 28662 23rd Bn. Manchester Regt. Pte. George Elliott Manchester Regt. Pte. Fred Green 23rd Bn. Manchester Regt. Sergt. Philip Haith 8th Bn. King’s Own (Royal Lancaster) Regt. Pte. Warwick Haith 22nd Bn. Manchester Regt. Pte. William Heyes  1/6th Bn. Manchester Regt. Pte. John Mc Cooey [1/8th Bn.] Manchester Regt. [Pte.] Henry Rankin 17189 20th Bn. Manchester Regt. William Ramsden 8th Bn. Manchester Regt. 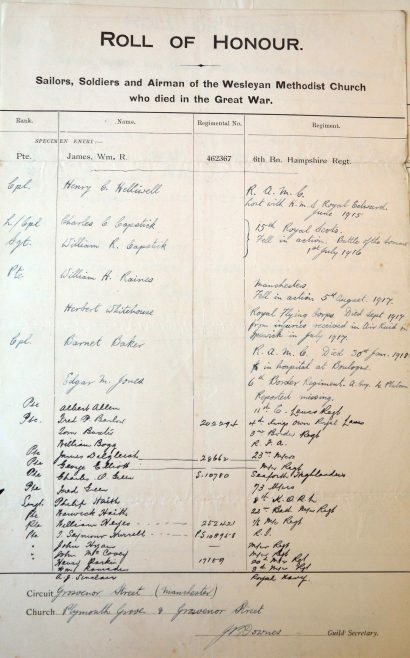 Additional sources: Commonwealth War Graves Commission, IWM Lives of the First World War.